The ABCD Diaries: Holiday Entertaining: Chicken Soup for the Soul Broths! Holiday Entertaining: Chicken Soup for the Soul Broths! I don't know about you, but I use A LOT of chicken broth when it comes to holiday cooking...from the stuffing to the green beans and lots more in between. So I was very excited to be able to try out the chicken broth from Chicken Soup for the Soul's new line of comfort foods! 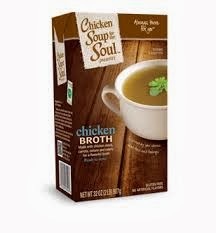 We tried the regular and the low sodium broths and were impressed by the rich, chicken flavor in both. What a great substitution to our regular canned broth! If you are looking for a hearty chicken broth that isn't overly salty and really brings out the flavor in your holiday dishes, give this broth a try! ABCD Diaries gives Chicken Soup for the Soul chicken broths an A+!